Traditionally focused on family, food and celebration, with a culinary style influenced by what is grown and raised on the land, olive oil and locals wine. Depth culture, traditional gastronomy, beautiful and natural landscape, coastline scenery and archaeology. Discoverpuglia makes itself your key to unlock the door and discover the beauty of these people, this extremely part of Italyâ€¦the real Puglia country leaving. 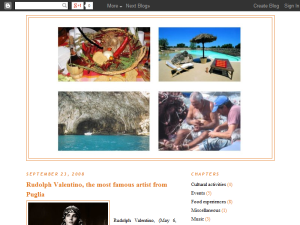 This what your Puglia Blog Ad will look like to visitors! Of course you will want to use keywords and ad targeting to get the most out of your ad campaign! So purchase an ad space today before there all gone! If you are the owner of Puglia, or someone who enjoys this blog why not upgrade it to a Featured Listing or Permanent Listing?